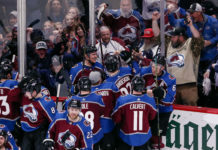 The Colorado Avalanche has yet to lose in 2018. 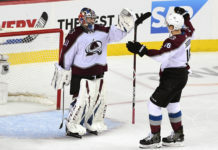 Following a 4-2 win in Toronto over their former goalie’s team, the Avs’ historic run continued with a playoff bid straight in their sight. As they have become accustomed to as of late in Semyon Varlamov‘s absence, Jonathan Bernier shined once more. Bernier fielded 31 shots from the Maple Leafs and stopped 29 — a 93.5 save percentage. His counterpart, Frederik Andersen, didn’t fare nearly as well. Andersen only stopped 23 (88.5 percent) of the 26 he faced. It was Bernier’s first trip back to Toronto since being traded from the Leafs to the Anaheim Ducks in July 2016. The Avs got off to a quick start as Gabriel Bourque bested Andersen just two minutes in to give the early advantage to the visitors. In the second, the Leafs’ Patrick Marleau wasted no time when he tallied the equalizer just 19 seconds in. Auston Matthews gave Toronto a lead at the 9:17 mark of the second. It is the first time in 2018 that Colorado has trailed in a game. Nail Yakupov would have none of that. Just over 90 seconds later, Yakupov tied the game again and turned the tide back in the Avs’ favor. 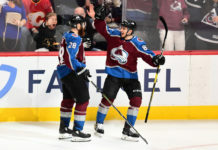 Blake Comeau scored the game-winning goal at the 12:17 mark of the third period — Comeau beat Anderson five-hole on a deflection from Carl Soderberg. It was Comeau’s ninth goal of the season. Gabriel Landeskog added an insurance goal at 19:06 with an assist from Mikko Rantanen. Ten Colorado skaters recorded points in the game. Nathan MacKinnon failed to score, ending his five-game goal streak and nine-game point streak. 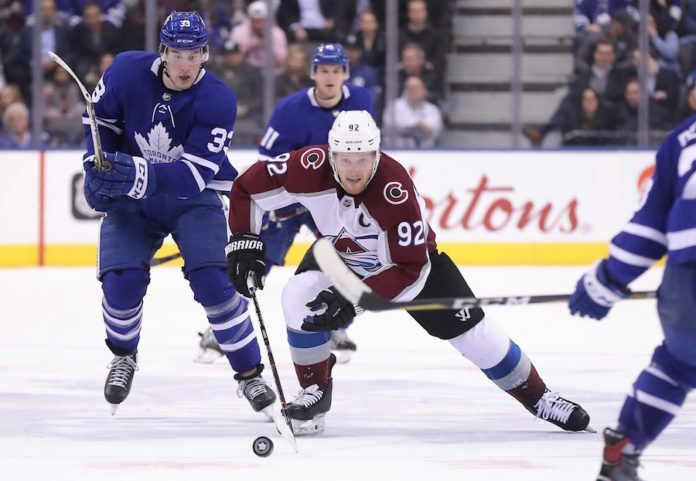 Now 10-0-0 since Dec. 29 — a streak that began with a win over the Leafs — the Avs are on a winning streak unmatched in franchise history since 1999. It is the second-longest winning streak in franchise history. The victory kicks off a season-long, six-game road trip for the Avs. Colorado will play 13 of their next 16 games on the road, with the All-Star break in between. Colorado can tie the franchise-record winning streak with wins on Tuesday and Thursday before the All-Star break. Colorado next travels to Montreal on Tuesday, Jan. 23 looking for win No. 11 at 7:30 p.m. With 57 points, Colorado remains in a Wild Card spot with two games in hand over Minnesota who also won on Monday.